Unfortunately, you won’t be finding any of this stuff in your local supermarket, but it is possible to get your healthy with your sweet. Sometimes called “protein fluff” protein ice cream is a sweet treat you can make at home to both enjoy dessert and recover from your workout. But before you reach for the next closest container of Ben and Jerry’s, see just how easy it is to make this healthy dessert. – Ice Cream Maker: Ranging from $40 to over $1,000 you have many options. If you think you’ll be making this a lot, it’s recommended to invest in an ice cream maker – purchase the half pint size to save money and calories. 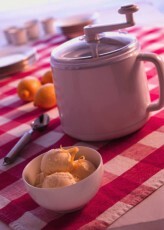 – Ziploc Method: If you aren’t quite ready to spring for an ice cream maker, you can use the Ziploc method. Step one: fill a larger freezer bag 2/3 full with ice and a half-cup table salt – this makes the ice extra cold. Step two: fill a regular sized sandwich bag with your ice cream mixture, seal, and place it into the bag of ice. Seal the larger bag and start shaking. Shake for about 5 minutes, or until it’s reached the consistency you prefer. – Use all frozen fruit: Some recipes call just for a food processor, which you may already have; the key is starting with frozen fruit, which allows you to simply blend down to a thick mixture. Once you’ve decided how you’re going to make it, it’s time to put the mixture together. 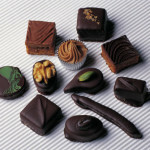 Because you’re creating this yourself, there are really no limits to what flavors or ingredients you can use. However, there are a few basic components that you want to be sure are included. 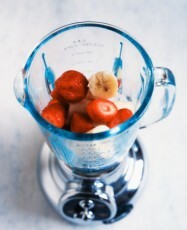 If using frozen fruit, the only next step is to blend your ingredients to a consistency you prefer. Otherwise, blend all ingredients in a food processor, and then place you mixture in the ice cream maker of your choice (See Ziploc Method vs. Ice Cream Maker, above). While this may not have been the end all be all of your sweet ice cream cravings, it’s a smart option for a quick and easy at-home treat that is both satisfying and healthy. 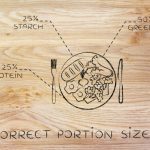 Portion sizes: How much is right? You Need to Gain Weight?